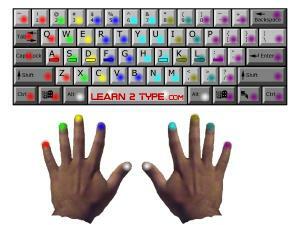 Learn2Type.com has FREE online typing lessons, exercises and typing speed tests available for the following keyboard types. Almost every English speaking country uses the standard QWERTY PC (or Mac) keyboard. As seen in the picture to the left, the first five letters on this keyboard layout are Q W E R T Y giving its name QWERTY. Click to sign up for FREE typing lessons and learn how to improve your typing skills on the QWERTY keyboard. Another popular keyboard layout is the DVORAK format. Named after its creator, the Dvorak keyboard is often credited as being faster to learn and more efficient than the standard QWERTY keyboard layout. Click to sign up for FREE typing lessons and learn how to improve your typing skills on the DVORAK keyboard. Many European as well as Spanish speaking countries use the AZERTY European keyboard. As seen in the picture to the left, the first five letters on this keyboard layout are A Z E R T Y giving its name AZERTY. This keyboard format allows the use of accents and other language specific characters that the standard QWERTY keyboard does not support. 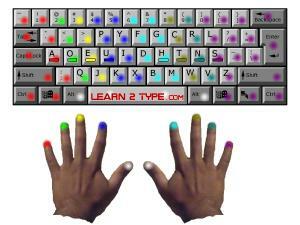 Click to sign up for FREE typing lessons and learn how to improve your typing skills on the AZERTY keyboard.